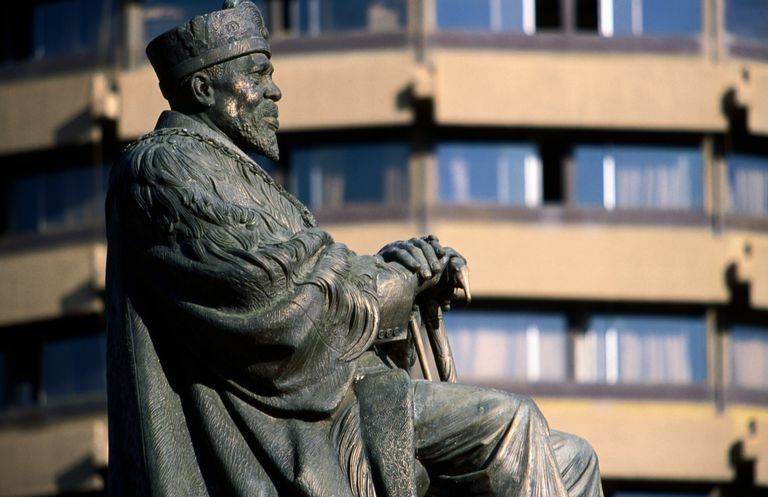 Jomo Kenyatta was the first President of Kenya and a prominent leader for independence. Born into a dominant Kikuyu culture, Kenyatta became the most famous interpreter of Kikuyu traditions through his book "Facing Mount Kenya." His younger years shaped him for the political life he would come to lead and holds important background for the changes of his country. Jomo Kenyatta was born Kamau in the early 1890s, though he maintained throughout his life that he did not remember the year of his birth. Many sources now cite October 20, 1891, as the correct date. Kamau's parents were Moigoi and Wamboi. His father was the chief of a small agricultural village in Gatundu Division of the Kiambu District, one of five administrative districts in the Central Highlands of British East Africa. Moigoi died when Kamau was very young and he was, as custom dictated, adopted by his uncle Ngengi to become Kamau wa Ngengi. Ngengi also took over the chiefdom and Moigoi's wife Wamboi. When his mother died giving birth to a boy, James Moigoi, Kamau moved to live with his grandfather. Kungu Mangana was a noted medicine man (in "Facing Mount Kenya," he refers to him as a seer and a magician) in the area. Around the age of 10, suffering form a jigger infection, Kamau was taken to the Church of Scotland mission at Thogoto (about 12 miles north of Nairobi). He underwent a successful surgery on both feet and one leg. Kamau was impressed by his first exposure to Europeans and became determined to join the mission school. He ran away from home to become a resident pupil at the mission. There he studied many subjects, including the Bible, English, mathematics, and carpentry. He paid the school fees by working as a houseboy and cook for a nearby white settler. In 1912, having completed his mission school education, Kamau became an apprentice carpenter. The following year he underwent initiation ceremonies (including circumcision) and became a member of the kehiomwere age group. In August of 1914, Kamau was baptized at the Church of Scotland mission. He initially took the name John Peter Kamau but swiftly changed it to Johnson Kamau. Looking to the future, he departed the mission for Nairobi to seek employment. Initially, he worked as an apprentice carpenter on a sisal farm in Thika, under the tutelage of John Cook, who had been in charge of the building program at Thogoto. As World War I progressed, able-bodied Kikuyu were forced into work by the British authorities. To avoid this, Kenyatta moved to Narok, living amongst the Maasai, where he worked as a clerk for an Asian contractor. It was around this time that he took to wearing a traditional beaded belt known as a "Kenyatta," a Swahili word which means "light of Kenya." In 1919 he met and married his first wife Grace Wahu, according to Kikuyu tradition. When it became apparent that Grace was pregnant, church elders ordered him to get married before a European magistrate and undertake the appropriate church rites. The civil ceremony didn't take place until November 1922. On November 20, 1920, Kamau's first son, Peter Muigai, was born. Amongst other jobs he undertook during this period, Kamau served as an interpreter in the Nairobi High Court and ran a store out of his Dagoretti (an area of Nairobi) home. In 1922 Kamau adopted the name Jomo (a Kikuyu name meaning 'burning spear') Kenyatta. He also began working for the Nairobi Municipal Council Public Works Department under Water Superintendent John Cook as a store clerk and water-meter reader. This was also the start of his political career. In the previous year Harry Thuku, a well-educated and respected Kikuyu, had formed the East African Association (EAA). The organization campaigned for the return of Kikuyu lands given over to white settlers when the country became the British Crown Colony of Kenya in 1920. Kenyatta joined the EAA in 1922. In 1925, the EAA disbanded under governmental pressure. Its members came together again as the Kikuyu Central Association (KCA), formed by James Beauttah and Joseph Kangethe. Kenyatta worked as editor of the KCA's journal between 1924 and 1929, and by 1928 he had become the KCA's general secretary. He had given up his job with the municipality to make time for this new role in politics. In May 1928, Kenyatta launched a monthly Kikuyu-language newspaper called Mwigwithania (Kikuyu word meaning "he who brings together"). The intention was to draw all sections of the Kikuyu together. The paper, supported by an Asian-owned printing press, had a mild and unassuming tone and was tolerated by the British authorities. Worried about the future of its East African territories, the British government began toying with the idea of forming a union of Kenya, Uganda, and Tanganyika. While this was fully supported by white settlers in the Central Highlands, it would be disastrous to Kikuyu interests. It was believed that the settlers would be given self-government and that the rights of the Kikuyu would be ignored. In February 1929, Kenyatta was dispatched to London to represent the KCA in discussions with the Colonial Office, but the Secretary of State for the Colonies refused to meet him. Undeterred, Kenyatta wrote several letters to British papers, including The Times. The security of land tenure and the demand for land taken by European settlers to be returned. Improved educational opportunities for Black Africans. The repeal of Hut and poll taxes. Representation for Black Africans in the Legislative Council. Freedom to pursue traditional customs (such as female genital mutilation). His letter concluded by saying that a failure to satisfy these points "must inevitably result in a dangerous explosion -- the one thing all sane men wish to avoid". He returned to Kenya on September 24, 1930, landing at Mombassa. He had failed on his quest for all except one point, the right to develop independent educational institutions for Black Africans.